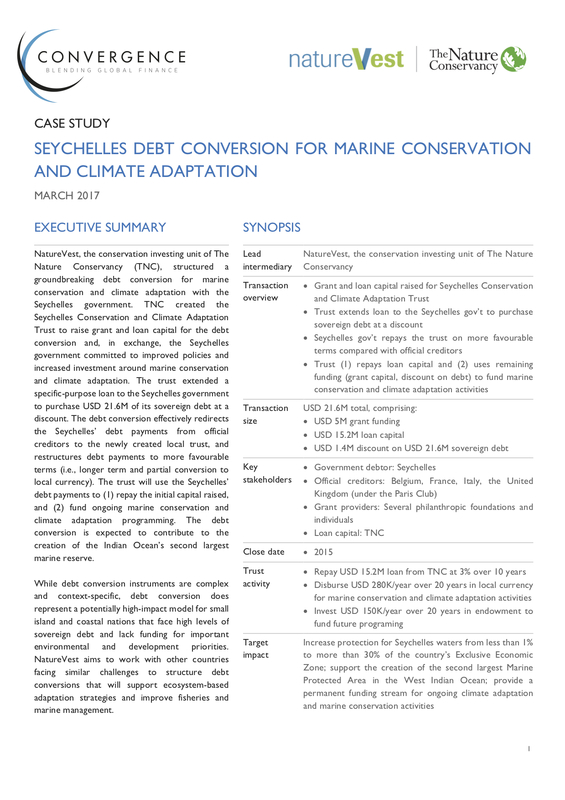 NatureVest, the conservation investing unit of The Nature Conservancy (TNC), structured a groundbreaking debt conversion for marine conservation and climate adaptation with the Seychelles government. TNC created the Seychelles Conservation and Climate Adaptation Trust to raise grant and loan capital for the debt conversion and, in exchange, the Seychelles government committed to improved policies and increased investment around marine conservation and climate adaptation. The trust extended a specific-purpose loan to the Seychelles government to purchase USD 21.6M of its sovereign debt at a discount. The debt conversion effectively redirects the Seychelles’ debt payments from official creditors to the newly created local trust, and restructures debt payments to more favourable terms (i.e., longer term and partial conversion to local currency). The trust will use the Seychelles’ debt payments to (1) repay the initial capital raised, and (2) fund ongoing marine conservation and climate adaptation programming. The debt conversion is expected to contribute to the creation of the Indian Ocean’s second largest marine reserve. While debt conversion instruments are complex and context-specific, debt conversion does represent a potentially high-impact model for small island and coastal nations that face high levels of sovereign debt and lack funding for important environmental and development priorities. NatureVest aims to work with other countries facing similar challenges to structure debt conversions that will support ecosystem-based adaptation strategies and improve fisheries and marine management.